April 5, 2018 Real EstateBy DEANknows! What is it and why is it dying? For years now, we have been working on providing holistic real estate lead generation. Although we primarily provide SEO for REALTORS, our overall goal is to provide a Return on Investment (ROI) for marketing dollars spent. SEO takes time. During the time that we are working: doing on-page SEO, writing original content and creating high-quality back-links and local SEO for Realtors we needed an efficient way to generate immediate leads. In addition, real estate SEO generally provides a huge influx of buyer leads as the clients are searching Google for terms such as *city* real estate or homes for sale in *city*. The ability to consistently and efficiently augment our buyer leads with seller leads meant that we were able to provide a holistic Digital Marketing solution. As of recently, our “go to” for immediate seller leads in the real estate vertical looks to be losing traction. The irony of the situation is that one of the driving forces for the decline in profitability of Facebook Seller Leads for Real Estate is that EVERYONE IS DOING IT. The specific marketing tactic, although once new and fresh has now become saturated. Our SEO clients, mostly real estate brokers, teams and agents, want to list more homes in their area. Since 2014, we have given our clients a cheap and steady flow of high quality seller leads through the advertising product that we affectionately call “Facebook Seller Leads”. When we launched this product in 2014, it was cutting edge and would generate between 15 and 25 new seller leads for as little as $5 per day! All of the leads that we would generate would be placed into a drip campaign that would follow up with the prospect for 18 months with text messages and emails. It worked like this: We create an attractive targeted Facebook Ad with the call-to-action “Get your Home’s Value”. 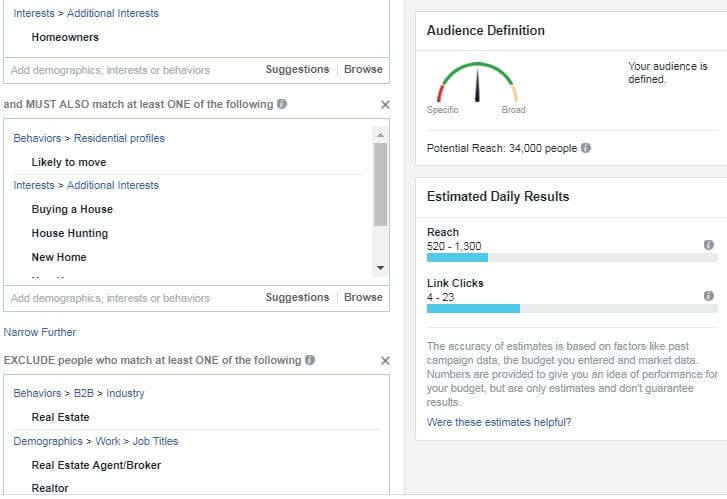 As with any Facebook advertising — the behavioral targeting is key to getting your ad in front of the people that will convert. We generally target men and women aged 26+ who live within about 20 miles of our primary city or community who are included in the Facebook demographics as “Homeowners”. Facebook has identified the person with the behavior “likely to move”. The person has shown an interest in either “buying a house”, “house hunting”, or “new home”. These settings could vary by the total population of a given area because in some instances, if the population was not dense enough, we would be forced to be more generic (not include as many demographics to narrow the display). Another option would be to expand the geographic area that the ad was shown to — as long as our client would take listings in the peripheral real estate markets. 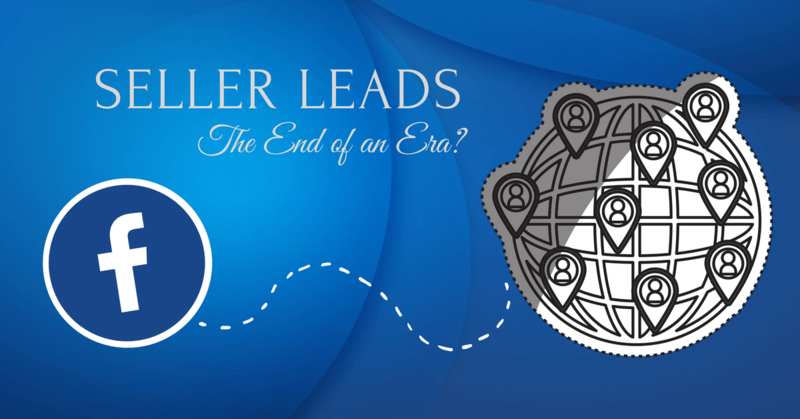 Why Was Our Seller Lead Generation So Successful? The secret in our sauce has been the landing page for the ad which consists of one form field labeled “Enter Your Address”. Before I share how successful this formula was for several years, I would like to examine the psychology of using this form with a single field versus other home valuation forms most REALTORS continue to use today. Most “get your home’s value” forms have a plethora of data they require to be filled out. A homeowner faced with entering multiple details about their home is looking at upwards of 5 minutes to complete the form. Some people consider this a serious commitment. Conversely, everyone knows they will never get any sort of home value without giving an address. For this reason, between 85% and 90% of those who clicked our Facebook ad successfully entered their address. Once the homeowner enters their address, they are taken to a second page which asked to provide their email so we could send them their report. Upon completing that form, another page would ask for additional information on the property. Whether they enter further details or not, the “next” page asks them to enter their email address to receive the home valuation. At this point, homeowners pondering whether or not to enter their email address also feel somewhat invested in the process…so much so that fully 80% of these homeowners enter their email address, giving us about a 70% participation rate. In addition, if the homeowner put in their address and choose NOT to proceed — we would use a 3rd party to acquire their information. This combination of creating a very low barrier of entry coupled with the stepping them through the process is what helped us achieve very impressive conversion rates. These Seller Leads are a gold mine when worked by an agent who is fully aware that each potential client is at their own unique point within the 18-month real estate sales cycle. Some of these homeowners may be just beginning to think about selling their home while others are ready to sign a listing agreement. Unless the owner indicated that they are ready to sell their home within the next 3 months, the best results come from adding them to the drip email campaign that includes a combination of emails and and text messages which went out over an 18 month period. At our peak. which lasted a couple of years, we generated between 15 and 25 seller leads for under $5 a day in advertising costs. Once other similar product hit the market, we leveled out at between 5-10 leads a day for $10 in advertising costs…and that lasted for a long time. In many of the more competitive and technologically aggressive real estate markets, that cost has risen to a point where the value has been lost because now so many others are using the same technique. The returns have been steadily diminishing and recently we started either lowering our management fee for this service or running new types of Facebook Ads for the same costs. Our prized Facebook Seller Leads process had started to move from a cutting edge Digital Marketing technique to a commodity. With the huge number of services now providing extremely similar systems, just about anyone could now roll out these types of seller lead campaigns. In our hyper-competitive markets, we have begun to discontinue the program entirely or move the spend to newer marketing options because the funds required for any results, in some markets, have become prohibitive. 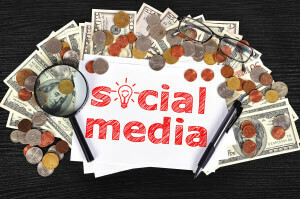 Perhaps the most interesting observation we have found while watching the demise of Facebook Seller Leads is the disconnect that has recently begun to appear between the number of clicks that Facebook reports and the number of homeowners that enter their home address. I mentioned above that we have set such a low barrier by asking only for the address on the landing page that we got an initial participation rate that steadily pushed 90%. That number has recently fallen to show that only about 40% of the clicks coming from Facebook now result in a street address being submitted for valuation. Why would someone click “Get Your Home’s Value” but feel reluctant to put in their address? Remember, these people are first targeted to show the ad to. A certain number of those people click the advertisement…Why would they NOW be scared to enter an address? This change has caused us to ponder at length about this dramatic change in the behavior of Facebook users and explore in depth possible causes. Although the staff of our preferred AVM (Automated Valuation Model) was exceedingly condescending when we raised the question, they eventually confirmed that their number of unique hits matched what Facebook reported. Did People’s Behavior Change or Was It Something Else? So did people change their behavior, or is there another reason for this change? Conventional wisdom dictates that human behavior is much more likely to remain consistent rather than change, and that when changes occur they are usually gradual and over an extended time. Accepting that, the most obvious answer is that bots from within the Facebook environment are inflating the number of clicks that advertisers are shown. If so, that is news.